OMEGA FL-1500 flow meters combine 2% accuracy and side plate construction at an economical price. 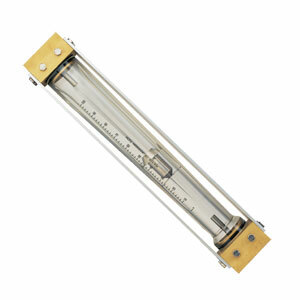 These flowmeters feature glass and 316 stainless steel construction, with aluminum side plates and acrylic plastic shields. The float design provides high immunity to viscosity variation, and the NPT thread connections provide easy installation into industrial and laboratory systems. For models with brass end fittings, add suffix "-B" to the model number, subtract $150 from price.